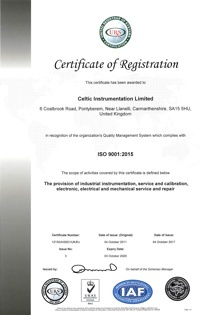 Celtic Instrumentation Ltd provides on-site instrument calibration services to UK Health Trusts, Laboratories and medical production facilities across England and Wales. We provide UKAS traceable certification in accordance to the ISO/IEC17025 international standard. Traceable certification is provided for numerous departments such as Sterile Services, Pharmacies, Estates and Facilities Departments to name but a few. All work is undertaken in accordance to our ISO 9001:2015 quality management accreditation system. Our on-going commitment and investment in high precision calibration test equipment will always provide our customers with the utmost confidence. All of our calibration equipment is routinely tested and certified by only the highest specification UKAS approved laboratories. We provide assurance of accuracy in infra-red thermometers, temperature mapping, sterilizer instrumentation calibration, quarterly testing equipment, positive pressure room calibration, fridge/freezer calibrations and wireless temperature monitoring and alarm systems.